Moving is a part of military life, and even though we know this and may have done it what seems like a million times, we don’t always know where to begin. Here's a basic checklist to help you get a smooth start on your PCS! And don't miss the free checklist for after your move-in at the end of this post. Your PCS Binder should include all documentation you may need upon arrival at your next duty station. For example, orders and moving documents, school and medical records, as well as other irreplaceable family documents. For more information on creating a PCS Binder, see MilitaryByOwner's video 3 Must-Haves for Your PCS Binder. Decide if you will do a DITY move ("Do It Yourself"), partial, or have the military move you. Each of these moving options require paperwork, so get it submitted as soon as possible. The more people involved in a transaction, the more potential it has for getting delayed. So get your paperwork in early! If you're moving yourself, this ensures you see a little compensation up front. If the military is setting up your move, this ensures that you have movers scheduled when it’s most convenient for you. If you need help deciding which type of move you should do, check out Should You DITY? Decide if you will sell or lease your home. If you own your home, will you choose to sell or rent it out once you're gone? If you're not sure which decision is right for you and your family, check out what MilitaryByOwner blogger Mary Eckberg has to say in Military Move Ahead: Should I Sell or Rent My Home?. If you're renting, now is the time to inform your landlord of your departure date. Research your new area on Military Town Advisor. Military Town Advisor features reviews from your fellow military families. Learn about places to avoid, good areas, schools, restaurants, etc. This information is published for your use as you move to the area. Just be sure to contribute a few of your own reviews to help out the next military family! Your Basic Housing Allowance (BAH) will likely change when you move, which will be the deciding factor in how much money you're willing to put toward your next home. Determining this before you move will help you have an idea of what you can afford and stay within your means as you start looking for your next home. Search for your new home on MilitaryByOwner. Whether you're interested in buying or renting your next home, MilitaryByOwner is the place to search. Just find your base, enter your search criteria, and house hunt as your heart desires! Contact the local housing office. If you've decided to live on base at your new duty station, get in contact with the local housing office immediately. Base housing is often limited and accompanied with a wait list. Get your name in early to increase your chances of base living. Additionally, the local housing office can recommend areas out in town to live. They also have a "blacklist" of properties and areas that should be avoided! Cancel utilities and hold mail. Sometimes this step gets overlooked, and the last thing you want to do is arrive at your new location and have missed payment notices because you forgot to let the utility companies know you moved. 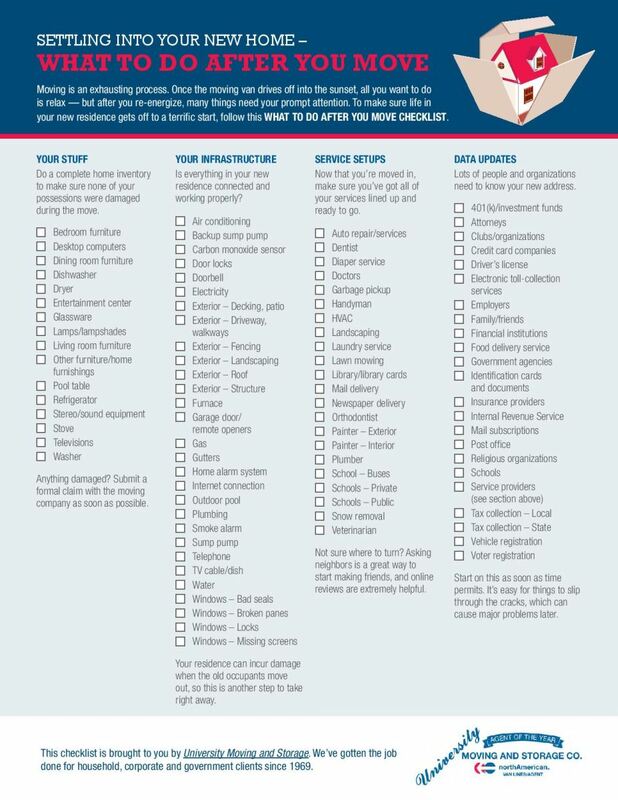 Use this PCS checklist to help you have a smooth start to your next military move! For more helpful information for your PCS, check out this free PCS Ebook. For even more help after you move in, see the handy checklist below from University Moving.